We partner with organizations undergoing strategic shifts in their business, helping companies such as yours align strategy, culture, structure and talent with a key goal: driving growth and delivering high-impact business results. Our team works with your internal stakeholders to ensure that strategic direction is clear, that the appropriate infrastructure and supports are in place, that the initiative is well planned and executed and that the model of success is clearly defined. 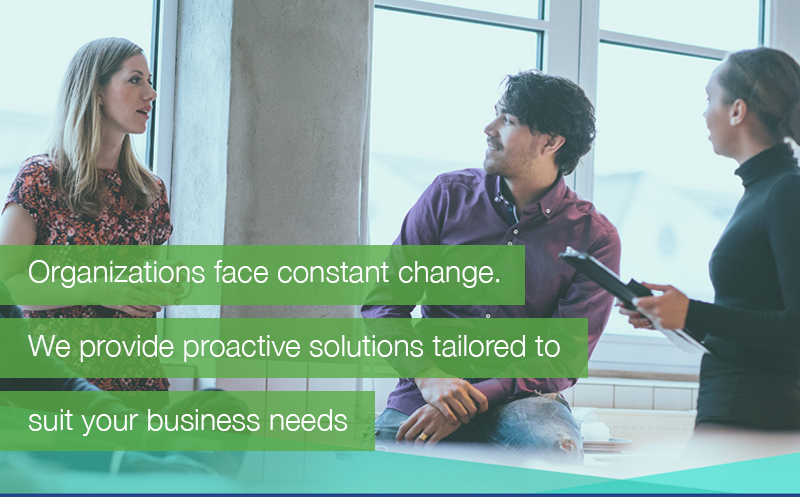 Our team will share its expertise across your organization to drive the transformation agenda, gain buy-in from employees and build organizational capabilities required to achieve business success. These changes can take many forms ranging from new leadership, enhanced product and service offerings, mergers and acquisitions, technology enhancements, expense containment and many more that significantly impact your workforce. Over time, an under developed or neglected HR infrastructure can threaten an organizations stability. We help our clients build the critical human resources infrastructure they need to engage, motivate, and develop employees. Our proactive, strategically-focused approach not only drives engagement levels, but allows employers to establish the kind of programs and services that employees need to realize their workplace potential. These shifts require a robust and integrated change-management methodology designed to ensure the smooth transition while accelerating the adoption of any new operational strategy.